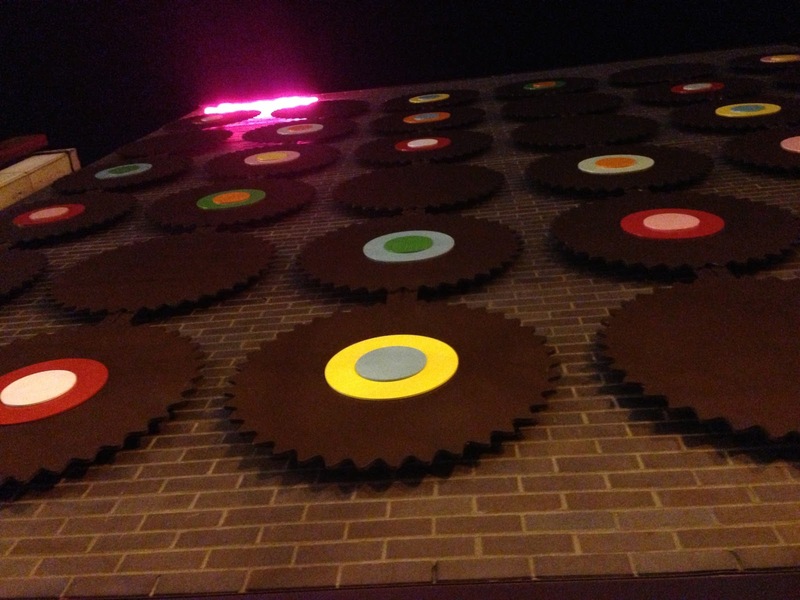 As one of the first cupcake shops that I heard about in the US, I was excited to find Sprinkles coming to Chicago. And even better... they were bringing their CUPCAKE ATM. Each day, they bake a few of their staple cupcake flavors alongside their "rotating menu." I do like how they have new cupcakes each day. The best part about sprinkles though is their ATM. It is filled each night with dozens of that day's cupcakes. They packaging and refrigeration system keeps the cupcakes fresh (I honestly couldn't taste any difference, and I have been here many times). The ATM is credit card only and does not take gift cards (we learned the hard way). It has been difficult for me to find the perfect cupcake so for now, I am giving them the highest rating of the places I have been... but still not a perfect 5 miles. I may have to change it once I try some other places in the city. The Cupcake ATM Which ones to choose... decided on 1 ended up with 3. The staple of all cupcake shops... the red velvet cupcake. It is the typical southern style light chocolate cake with the red food coloring. As always, it is topped with a cream cheese frosting. The cake on this was light and fluffy. The chocolate flavor in my opinion was almost non-existent, but the cream cheese frosting made up for it. In fact, the cream cheese frosting was by far the best frosting out of the cupcakes we tried. This is definitely a safe bet and one of their most popular cupcakes. It is offered everyday and they even have a vegan option. So definitely check it out. 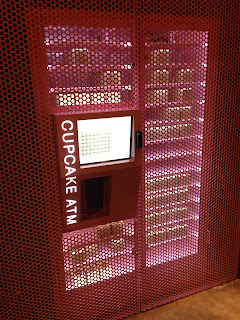 Immediately after we saw this cupcake scroll through on the ATM, we all knew we wanted to try it. The black & white cupcake is a belgian dark chocolate cake topped with a vanilla cream frosting. The cake was incredible. 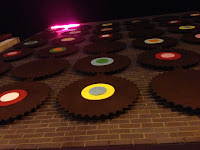 The chocolate was rich, yet fluffy and not overwhelming. The vanilla frosting had a strong vanilla flavor that paired well with the cake. Overall, it was everyone's favorite cupcake. This cupcake reminded me of a childhood snack cake... Hostess's Ho Hos. So with Hostess being out of business, this may be the next best thing. It is a dark chocolate cake which is injecting with a marshmallow cream filling and topped with a bittersweet chocolate ganache. It was definitely the richest of the three cupcakes we tried from the ATM. It was almost too sweet even to my roommate and my sweet tooth's likings. Luckily, we shared all of the cupcakes, making it a little more bearable. If you order this cupcake, make sure to have a large glass of milk, or in my case, a large glass of ice water to wash it all down! - They do have a doggie cupcake for $1. Make sure to pick one up! - CUPCAKE ATM!!! come anytime in the night... just don't expect them to have every flavor in stock. - Driving around this area during peak hours and weekends can be tough... and parking even tougher so I suggest taking public transportation.